Join us for a private evening of theater benefiting Generation Citizen. White Noise, Written by Suzan-Lori Parks, Directed by Oskar Eustis, Starring Daveed Diggs, Sheria Irving, Thomas Sadowski, and Zoë Winters is a story about Longtime friends and lovers Leo, Misha, Ralph, and Dawn who are educated, progressive, cosmopolitan and woke. But when a racially-motivated incident with the cops leaves Leo shaken, he decides extreme measures must be taken for self-preservation. Generation Citizen is a national nonprofit dedicated to reinvigorating civics education in schools through a new and exciting approach: Action Civics. GC partners with middle and high schools in the flagship New York City region, as well as in 5 other regions nationwide, to educate and empower students about how to effect systemic change on an issue directly impacting them by engaging directly with government to solve a local problem. 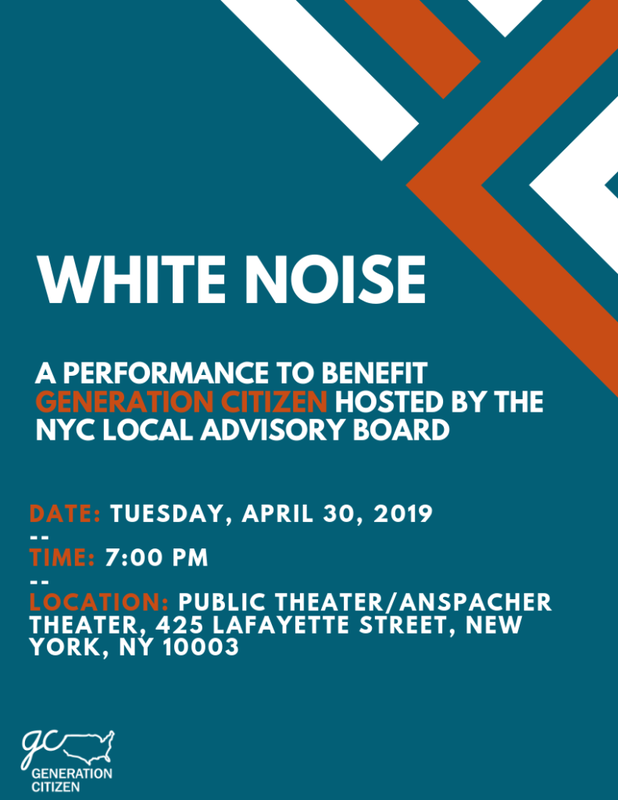 Tickets for White Noise are *$150, which will support Generation Citizen New York City in providing an Action Civics education to New York City public school students. If you are unable to attend White Noise, please consider making a donation to Generation Citizen. Generation Citizen is a 501(c)3 tax-exempt public charity. The tax-deductible portion of your donation is $82. The purchase of your ticket will go directly to Generation Citizen New York City programs.